New year, same mouthwatering pizza! 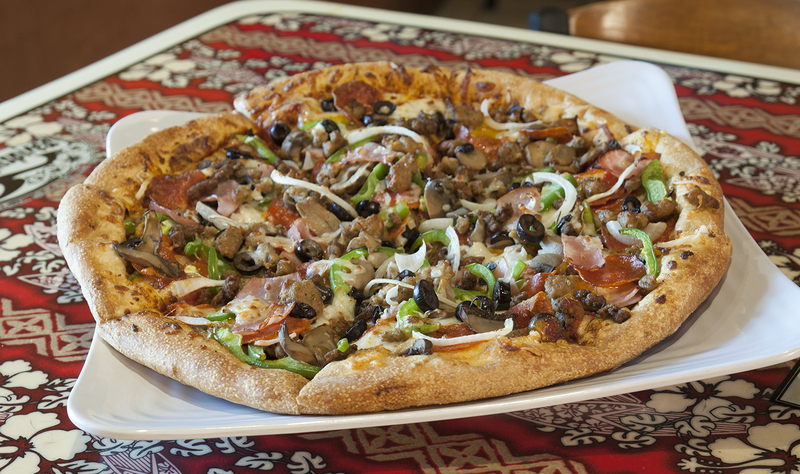 At Ultimate California Pizza, Myrtle Beach, we offer a wide variety of handcrafted pizzas and we want you to try them all to find your Ultimate favorites! We offer a ton of fresh toppings to create flavor combinations that will satisfy everyone in the family. There’s a reason we’re a favorite of both locals and tourists and are known to serve the ‘Best of the Beach’ pizzas in Myrtle Beach! Our ‘Plain Jane’ cheese lovers unanimously agree that our Ultimate Cheese Pizza is exactly that; ultimate. We took a tried and true classic we fell in love with as kids and perfected every aspect to make it an even tastier adult version! Beginning with our hand tossed dough for the crust, we then spread out our Ultimate Red Sauce. From there it gets super cheesy – adding mozzarella, cheddar, Monterey Jack and provolone. And Voila! You’ve got a super cheesy, melt in your mouth cheese pizza! When you’re in the mood for a fiesta, we have a pizza fit for a party! Our Mexican Hippo Pizza brings together the best of both worlds: pizza and nachos. On top of our hand tossed crust, we use our homemade fire roasted salsa, then we add some crisp green peppers, fresh ground beef, roasted red peppers, onions, jalapeños, cheddar, mozzarella, shredded lettuce, and tomatoes! Served with a side of sour cream for your dipping pleasure. And the pizza is topped with crumbled tortilla chips inspired by the chips used on the ‘Best of the Beach’ nachos at Nacho Hippo. Each pie is made to order, so whatever needs you have, no matter how specific your diet, we can accommodate you dietary needs! We offer gluten-free crust and even vegan cheese, so you can still satisfy all your pizza cravings without any issues! To make the kiddos happy, we have a mash-up of everyone’s favorite foods: pizza & PB&J! Our PB&J pizza is exactly that – peanut butter and jelly spread over a pizza crust! Picky eaters and kids alike will go nuts for this pie! Plan a visit to one of our six Ultimate California Pizza locations around Myrtle Beach and enjoy a ‘Best of the Beach’ pizza with friends and family! Can’t make it in? We offer carryout and delivery options as well!